learn in this creative environment. They’re finding a culinary landscape that makes the state a delicious destination for people with a range of culinary predilections. Maine chefs are hot—not just popular but drawing heavy-duty national acclaim-- its farmers markets are booming, specialty foods, microbrews, and wines are winning national and regional awards, and foragers are finding an array of wild edibles that offer new taste sensations to adventurous eaters. For the dedicated foodie, Maine has something exciting to offer, something distinctively its own. Fill in the form below and we'll send you an email with all our current deals for Maine. Seaside Breezes, Sun-Drenched Days, Hands-On Cookery and Gourmet Dining! In our classes, you will learn techniques for searing, sautéing and deglazing. Producing a perfectly browned piece of meat or fish often eludes even experienced home cooks. Come and learn the tricks of the trade in our technique-based classes. Make your downeast Maine vacation a culinary adventure as you learn cooking skills and techniques while exploring the beauty of the downeast Maine coast and Atlantic Canada. Classes are held on a unique 150 acre blueberry farm perched above Passamaquoddy Bay. Lisa is able to bring her culinary expertise to individual homes and businesses to teach cooking classes. These classes are designed around the foods and techniques that Lisa incorporates into her cooking. Whether it’s for beginners or fledgling chefs, there is always an exciting course for your group! We are a place where kids learn about healthy cooking choices in a fun, tasty and nurturing environment. We have created a kitchen "like home" that provides your child with confidence that they can take what they learn here at Healthy Habits Culinary Studio, and reproduce the techniques at home. Whether there is a group of new mothers who want to learn about healthy cooking for babies, or a bunch of guys that have caught the big fish, we have a variety of chefs that will teach technique or any specialty that interests you. Our class setting is small. We believe in hands-on so we keep the maximum number to 10. We have many classes to choose from with "Homemade Pasta" being our most popular class. You can learn everything from sushi to knife skills. We especially like doing our kids classes. Join Maine Foodie Tours and TASTE your way through town! Learn why Portland, Maine was named "the foodiest small town in America" by Bon Appetit (October, 2009). Our entertaining guides will immerse you in rich cultural history while satisfying your taste buds with the culinary delights of Maine. Visit us at www.mainfoodietours.com. 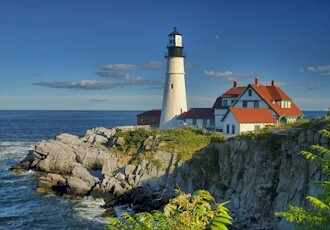 Portland Maine was recently named by the Food Network one of the 3 top culinary destinations in the United States. Man with a Pan Culinary Adventure will explore the Southern Maine region of Greater Portland so you will discover why it earned this honor. Matthew Kenney Academy courses are open to those who are interested in exploring aspects of high-level raw food cuisine in beautiful, mid-coast of Maine. This course employs a project-based learning approach in a collaborative setting, emphasizing the use of raw food techniques in a real-world environment. Now You’re Cooking is located in historic downtown Bath, Maine, occupying the first floor of one full block adjacent to City Hall, at 49 Front Street. In addition to fabulous cookware, Now You’re Cooking also hosts cooking classes, weekly product demonstrations and monthly wine tastings. Each class, under the guidance of resident chef Kathy Winberg, includes recipes, a generous sampling of all the prepared dishes and delicious wines. Class size is limited to ensure an intimate learning environment for all levels of home cooks, from the beginner to the aficionado. Penobscot School’s primary mission is to offer effective courses of language study for adults. In an effort to expose students to the true culture of their country of interest, Penobscot School now offers an international cooking class series. The Stonewall Kitchen Celebrity Chef Series is offered at our Company Stores throughout New England. Cooking Classes include recipe tastings, printed menu packet, Stonewall Kitchen product samples, and 10% off any store purchases made that day. The classes are informal with ongoing interaction between chef and students. Black Tie Cooks offers hands-on and demonstration cooking classes in our professional kitchen, taught by an assortment of our world class catering chefs and guest professionals. These classes are intimate and have a maximum of 12 students each. Savor the zest of life by mixing cooking and friendship. Add fine wine to complete the event, and you have our Cook Without Fear program. You will work side-by-side with us as you prepare a complete five-course meal and sit down to eat it, accompanied by fine wine. Invite your friends and family over for a cooking party with The Tasting Spoon. Learn new techniques and cuisines, then sit down and enjoy what you made. All recipes are provided so that you can prepare these delicious dishes on you own. This special gala event features table service and multiple courses of chocolate tasting. Become immersed in a world of top chefs, fine wines, beautiful homes, acclaimed artists & the quintessential oceanfront charm of Kennebunkport. This week of world class wine, learning experiences, and award-winning food will launch you into summer with style. Bakers from around the country come together to share their love of whoopie pies with the world! Time to honor our maritime history and celebrate the vital role it plays in the lives of all who live here. The Strawberry Festival is a yearly event filled with entertainment, food, artisans and strawberry shortcakes! A celebration of the brown egg industry, an Early Bird Breakfast, chicken barbeque, craft fair and fireworks. A buffet picnic lunch of locally grown and prepared foods and a hand-made ceramic plate of your choice to keep. Parade; fireworks; clam shucking contests; a firefighter's muster; a pancake breakfast; concerts; and, of course, a delicious array of food. Brings together farmers, bakers, and earth oven enthusiasts to explore the art and science of growing & milling grains & baking artisan breads. Wood-fired oven demos, artisan bread samples, & opportunities to talk with bakers to explore books, tools, & accoutrements to artisan bread baking. 20,000 pounds of lobster, parade, top notch entertainment, fine art, crafts, cooking contests, marine tent and more! Blueberry muffins, cake, & pies. Blueberry cookoff & chili contest, blacksmithing, music & fireworks. Music, crafts, fireworks, ploye eating contest, and world's largest ploye--a type of buckwheat pancake. Maine blueberry pancake breakfast, craft fair, lobster dinners and a parade down Main Street. The 50th annual festival will feature classic country music and a storytelling performance. Enjoy a scrumptious lobster dinner. The Chili Cook-Offs are sanctioned by and run in accordance to the rules of the International Chili Society. Sanctioned by the International Chili Society with winners in various categories - Chili, Chili Verde, and Salsa. Sample over 100 releases from some of America’s best craft breweries!